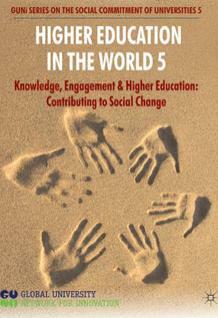 The new edition of the GUNi Report Higher Education in the World 5 explores the critical dimensions in our understanding of the roles, and potential roles, of higher education institutions (HEIs) as active players in contributing to the creation of more just and sustainable world. Within this context the GUNi Report looks to answer the call of the challenges of our time, while maintaining an eye towards the future regarding the role of knowledge and HEIs. Analyze how we are managing knowledge in society, the different ways in which it is created, how it is differently valuated, its ethical implications, the different understanding between what is knowledge and what it is not, the ways of knowledge distribution and consumption, and its social uses for addressing the current emerging issues and pressing problems. Illustrate, describe and analyze the current concept of community university engagement and social responsibility in both levels, global and regional, around the world. Illustrate how HEIs have linked knowledge with society. Presenting the different practices, mechanisms and structures, including the impact of engagement in teaching, learning, research and institutional activities. Identify differences and similarities within the different world regions. Illustrating peculiarities among countries and providing a current territorial and thematic map about how HEIs are engaged with society. Identify how the social actors are involved in the engagement practices and interact with HEIs, including leadership, participation and decision making process. Offer a tool box for higher education practitioners through examples of good practices, innovations, relevant experiences and/or projects to move forward.